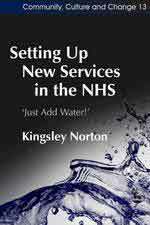 Setting Up New Services in the NHS, Just Add Water! As a provider of care and housing for older people, I am constantly intrigued by people’s attitude to change. It is not easy to encourage a culture where change and development are the norm rather than the exception. It is not always possible to explain the rationale behind the innovation. Kingsley Norton, Head of Psycho-Therapy in a London hospital, offers a guide for setting up a clinical service in the NHS. The worked case study he uses is a democratic therapeutic community (TC) for personality disordered patients. Norton takes the reader through the entire process of setting up these new services. The author is able to demonstrate the complexity of the task and offers lessons for those who wish to learn from the review of the project. Anyone interested in managing change in any environment, especially if they want to innovate, would benefit from this book.